After the curiosity of 3 days on exit re entry fee of SR 600 and multiple exit re entry of SR 1100 in almost all Saudi banks Sadad system, Now Sadad updated as per the approved exit re entry fee which is SR 200 for two months, SR 100 for each additional month and SR 500 for two months multiple exit re entry and SR 200 for each additional month. - Now you can choose exit re entry and multiple exit re entry duration in months like 30 days, 60 days, 90 days, 120 days, etc,. upto 3 years, By selecting the duration of exit re entry or multiple re entry you will get the fee. - For example if you choose three months exit re entry, the fee will be SR 200 for two months and for additional month SR 100, so it will be SR 300. 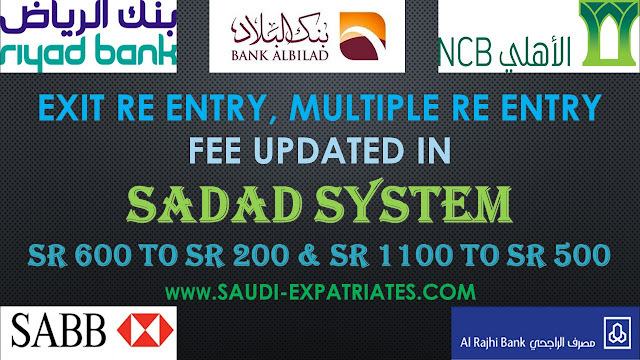 Similarly for four months the fee will be SR 200 for 2 months and for additional two months SR 200, so it will be SR 400. - Whether you choose 30 days or 2 months the exit re entry visa will be SR 200 and then for each additional month SR 100.